Why Did Cambodia’s Hun Sen Reshuffle His Cabinet? A closer look at the move and what it means. Cambodia’s prime minister Hun Sen has again reshuffled his cabinet as his long-ruling Cambodian People’s Party (CPP) struggles to find relevancy with an electorate which has grown tired of corruption and a persistently widening wealth gap. Importantly, Hun Sen appears to have shored up his reform agenda, helped by the retirement of career diplomat Hor Namhong. 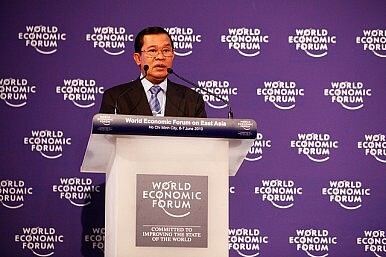 He served as Cambodia’s foreign minister between 1990 and 1993 and again since 1998 but his career was dogged by claims he collaborated with the Khmer Rouge. Hor Namhong, 80, was replaced by Prak Sokhon, 61, a former advisor to Hun Sen who became the Minister of Posts and Telecommunications after the 2013 election when the CPP was returned but only after the party suffered a big swing against it. Ministers for land management, commerce, agriculture, transport, rural affairs and religion were also replaced in the mid-term reshuffle. Some resigned before they could be sacked. “There is no minister that is too bad, only some ministers who have been appointed to a position are a little slow, so we are changing this point,” Hun Sen told a graduating ceremony in the capital ahead of the reshuffle. His remarks and the reshuffle followed the biggest shakeup in years within the Cambodian government with the ministers of agriculture, finance, commerce, education, culture, environment and telecommunication all replaced in the wake of the dismal electoral performance. Importantly, the ministers of education and environment – key portfolios earmarked for reform – were left untouched. Sources close to the government say a battle has emerged between environment and the Ministry for Agriculture, Forestry and Fisheries (MOAFF) which has traditionally controlled the land – and what’s in it – for decades and has come under fire for corruption ranging from illegal logging to land grabbing. MOAFF officials, they say, have persistently attempted to block efforts to have what’s left of Cambodia’s jungles transferred to the Environment Ministry. The appointment of the popular Chea Sophara from rural affairs to the land management ministry should help smooth this process. Education reforms have also won supporters with a crackdown on cheating, grade inflation and corrupt teaching practices across the nation’s schools. These issued had resulted in the pass rates of all high school students falling to an abysmal 25.7 percent from a norm of almost 87 percent. Hun Sen has become increasingly proactive within CPP ranks, aiming to recapture the political ground lost to the opposition Cambodian National Rescue Party (CNRP) almost three years ago. Importantly, commune elections, where Cambodians vote for commune chiefs who represent clusters of villages, are due in June next year and will be an important test of Hun Sen’s popularity. His support base remains in the rural heartland, while the CNRP has traditionally done well in Phnom Penh and the provincial cities. General elections are due in July 2018. However, Cambodia’s reputation for mixing violence with politics is still never far away. In November, two CNRP politicians were dragged from their cars and beaten outside the National Assembly while on their way to work. At around the same time, the wife of prominent opposition figure Kem Sokha was terrorized in her family home. Two months ago a 49-page document, leaked at the CPP’s annual congress declared a need for the party to reestablish its credentials with the grass roots and among young voters, urging it to speed up the slow pace of reforms. Winning support from Cambodia’s burgeoning youth is a priority. About 65 percent of Cambodia’s 15 million people are under the age of 30 and have to date thrown their lot in behind the CNRP and its leader Sam Rainsy, who currently lives in self-imposed exile in France. The cabinet reshuffle is expected to be approved by the CPP-controlled National Assembly on April 4.